Today is the day we commemorate Patrick of Ireland, an amazing missionary who accomplished so much, and has been so beloved down through the ages that vast quantities of legendary material have stuck to him. 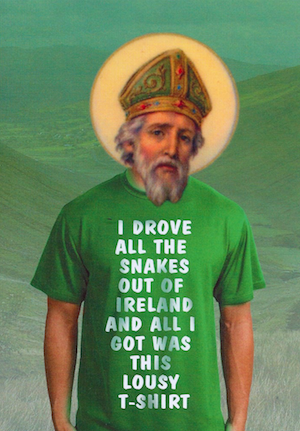 I don’t want to get into the arguments about whether he really used a shamrock to explain the Trinity, whether there were really any snakes for him to chase out of Ireland, whether he had anything to do with that great “I bind unto myself today the strong name of the Trinity” prayer. Historians agree broadly on two things: (1) there’s a real, important, and impressive historical core to all things Patricky, and (2) most of your favorite things about Patrick don’t belong to it. For instance, did you know he never drank green beer?
. . . Without any doubt, in that day we shall arise in the brightness of the Son, that is, in the glory of Jesus Christ, and, all redeemed, we shall be, as it were, the sons of God and co-heirs of Christ, and made like to His image in the future. For from Him, and by Him, and in Him, are all things: to Him be glory for ever. Amen. Verily, in Him we are to reign; for that sun which we look upon, at His command rises daily for our sakes; but it will never reign, neither will its splendour last. Moreover, all those unhappy ones who adore it shall end miserably in tortures. But we believe and adore the true Sun, Jesus Christ, who will never fail, neither shall he who does His will, but for ever he shall stand, as Christ stands for ever, who, with God the Father Omnipotent and the Holy Spirit, reigns before all time, and now and for ever. Amen.